The Cadenza leader will welcome many international DJs in the Terrace of the Playa d'en Bossa club. The German duo Âme (DJ Set), Audiofly, the powerful Ben Sims, French dOP, veteran Josh Wink, Josh Wink (Art Department), Berghain resident Len Faki, tribal rhythms by Livio & Roby, Berlin sound by Martin Buttrich, DJ Sneak and American master Stacey Pullen, are just a few examples of the top-artistic quality of Vagabundos. Other DJs such as Space Ibiza resident Javi Bora, Alfredo, Andy Baxter, Behrouz, Ilario Alicante, Monika Kruse, and more artists to be confirmed, will complete this incredible line-up. 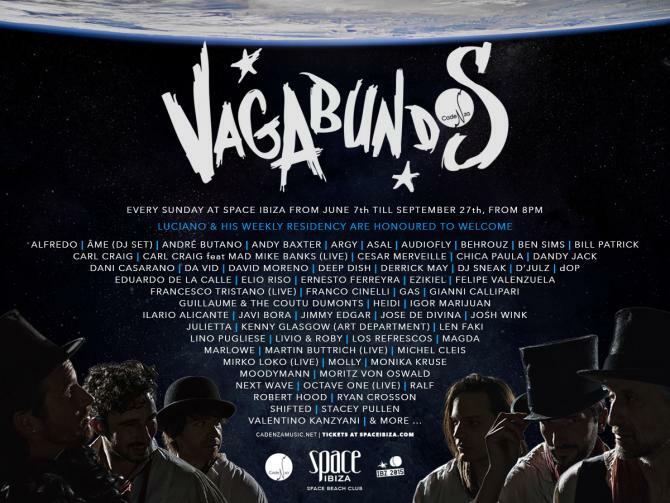 Tickets for Vagabundos at Space Ibiza are available here. Vagabundos they name us, Vagabundos they call us, Vagabundos we are!